Michael joined Rabobank International in 2007. 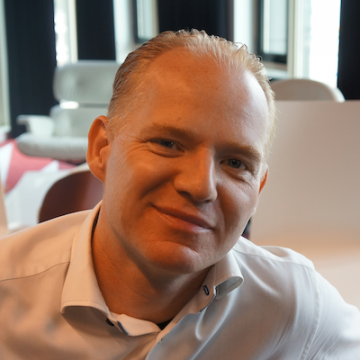 Starting 2011, Michael took on a new role as Head of Strategy & Innovation with Rabobank NL, looking after Rabo’s strategic direction in transaction banking with a team of 5 professionals. Key responsibilities: (long-term) strategy definition, client centric innovative solutions and business development. The team is also responsible for Rabo’s mobile payment initiatives for corporates with a clear goal: to make Rabobank the leading Dutch player in mobile payment and mobile services. Before this, Michael worked for ABN AMRO Bank in London. He started his career at ABN AMRO in 1996. In 1999 he moved to Spain where he became a member of the management team for corporate cash management in Europe, responsible for business acquisition in Southern Europe. In 2004 Michael moved to London where he took on the position of global cash flow advisor for the largest commercial banking relationship of the bank. Michael acts as coach for entrepreneurs. Michael holds a bachelor’s degree in Economics and obtained his MBA degree from NYU Stern.